When I first got started in the ebike thing, what I really wanted was a tiny 7lb battery that I could throw in a backpack and ride for 90 minutes in the woods with. After a lot of experimentation what I ended up with was a 16lb battery that I kept in my backpack that would generally last me for about and hour of riding. 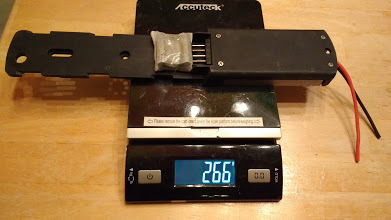 My 20Ah Prismatic Cell LifePo4 pack quickly degraded from 20Ah down to 12Ah of capacity, and I have a strong suspicion that it was made out of recycled Nissan Leaf cells. The pack was incredibly cheap at $500 through ebay and it was shipped illegally to me, not as hazmat goods like it should have been. After the charger exploded in my house I made a decision that I would not buy any more cheap ebay batteries. Because I wanted the lightest batteries I could get away with I experimented with both Lipos and LifePo4 Pouch cells from Hobby King. The cells got so hot I was worried about them starting on fire at power rates that were far below the batteries rated C-rates. The packs quickly puffed up and I didn’t feel comfortable strapping puffed packs to my back and riding around in the woods with. 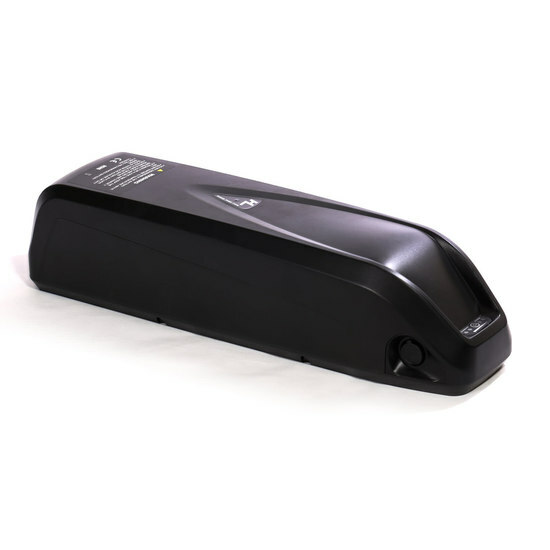 Over the past year, the battery technology has steadily improved to the point to where I feel like the 18650 cell technology has reached a point where you would be crazy to consider using anything else. The 13.5Ah NCRb pack I bought about 6 months ago from Lunacycle.com for $435 right here was reviewed as the “best pack I ever owned“. The only problem with the NCRb pack is that with a 4P configuration it simply would get too hot for my comfort zone when run at high power with a 30Amp BBSHD drive unit. 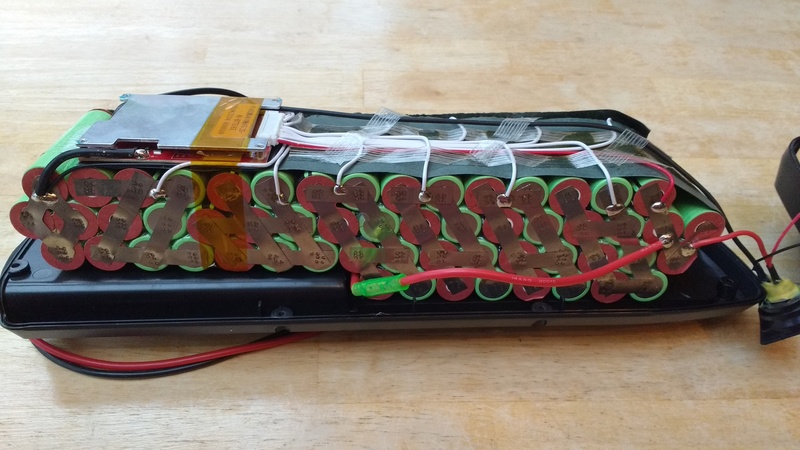 This battery works very well with the 25Amp BBS02 and I have been running it about 2-3 times a week for the last several months without any issues in this configuration. The NCRb pack BMS would get a little finicky when it was thrown in a backpack, mostly because it didn’t like the spark that would form when I hooked up the Anderson PP connectors. I opted to mount it on my N380 equipped Deadeye “Duh Banana Bike” build and I have no issues when the battery is mounted on a frame like it was designed to be. For whatever reason the GA shark pack does not have the same issues with the NCRb pack and it seems to be perfectly happy to be thrown in a backpack. The Luna GA Shark packs are packed to capacity and they couldn’t use the 18650 frame stencils so the packs are glued together. The NCRb pack is shown, the GA pack is identical but with red cells. Red goes faster. The NCRb and GA cells are both made with the same chemistry (NCA) and this chemistry tends to run hotter than INR chemistries. The NCA chemistry also tends to run better when the cells warm up. After an hour or so of a 7amp drain or so the pack gets noticeably warm. If this pack is mounted on the bike instead of in a backpack then it will have no problems keeping cool. I have run this pack repeatedly through 6 inches of heavy wet powder for over an hour with the pack wrapped in a Thermarest pad and stuffed in a backpack and it has not gotten hot enough to trigger the BMS thermal shutoff. The Sanyo\Panasonic NCR18650GA cells are rated at 10Amps continuous discharge and there is some speculation that it could be even better than that. When I run the GA pack with full throttle for extended periods of time the pack does get pretty warm, but I have yet to hit the thermal shutoff for the BMS. Be aware that if the outside of the pack is hot, the batteries are about 10 degrees hotter. Your shark pack should never too hot to hold in your hand, if it does then something is seriously wrong. My only complaint about this pack is that it can only provide 30Amps continuous. Unfortudently, there are no 50Amp Cont BMS’s that are small enough to be able to squeeze into this shark pack, so if you need more power than 30 Amps you will have to pick a bigger soft pack battery with a high power BMS. What is happening right now with ebike packs is that as the cells get more powerful and have longer range people keep wanting better and better packs that provide a lot more power, are much smaller and have a longer range. With the 2016 cells being so much better than the cells of yesterday I can say that there seems to be no end in sight. I’ve also discovered that you can mount the shark pack in locations where the screw holes do not line up. 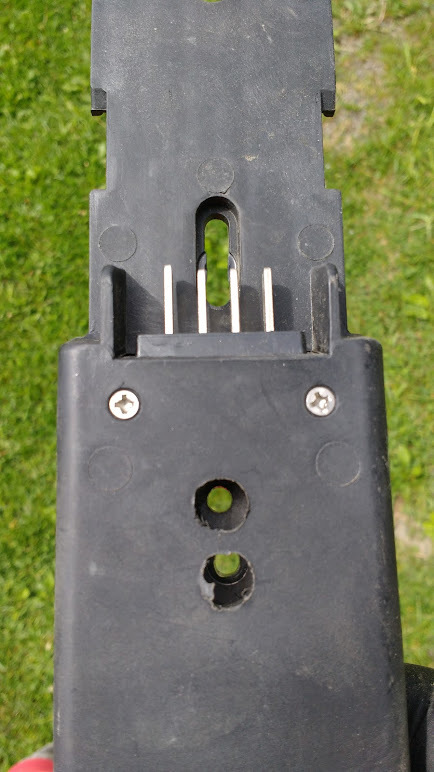 The bottom half of the shark pack bracket is an area designed to house a 6FET ebike controller. It has a metal heatsink and you can easily take apart the mounting bracket and just drill a large hole through the plastic about where you need it and then drill a smaller hole through the metal and then use your water bottle holder bolts to through the metal plate to hold it more securely to the frame. So what was my final verdict on the 13.5Ah GA shark pack? I was able to get over 14Ah of power on a 13.5Ah rated pack with hard riding which almost never happens. The pack got warmer than I expected, but it also was not plagued by the annoying spark detecting shutoff that my NCRb pack has had twice. If I had mounted the NCRb pack on my frame from the get-go and used it the way it was designed to be used then I would not have had those issues, but the GA pack does not seem to have the finicky spark detecting shut off that the NCRb pack did. In short the GA pack is everything I’ve ever wanted in a pack, high power, long range, works well with the BBSHD without overheating and it is really insanely inexpensive at only $545 (without a charger) right here. I wish this pack was available 2 years ago, it would have saved me a lot of money and headaches. Can’t fit the bracket on your bike? Drill baby, drill. Just watch out for those wires. At least I got the hole right the second time. The Sanyo\Panasonic NCR18650GA 52v 13.5Ah 7lb Shark pack has taken over the title of “The Best Pack I’ve Ever Owned”, sorry NCRb. You have been dethroned. This is a great pack with one issue that can pop up eventually: there is hardly any padding around the cell. If the cells move around and get damaged, this can lead to an explosion. This is the main reason why most other vendors don’t stuff the extra 4 cells in there. They use the space for heat resistant padding. The GA pack is padded pretty well and does not move inside the case. That being said I will agree that cell stencils are safer than glued packs. I’m doing an article on that in about a week. Stay tuned. Another great article that is spot-on. If you want a full-suspension frame, there is very little room for the battery pack in the triangle, and that is one of the design goals of the shark-pack….to fit as many full-sus frames as possible. But…once you commit to a slim case, it restricts the number of cells. So…to get decent performance and range, you have to upgrade the cells to the best available. By saying the NCR-B cell is perfect for the BBS02, and the GA cell is perfect for the BBSHD…that is the type of info that the new ebikers desperately need, so they can make smart choices the first time. Great discussion of the battery cell market. I just can’t believe you run the pack hard and end up with more amp hours than the rating. The legal limit runs around 750 watts. The big companies make motors that can pull that amount of power, but they never say much about the batteries. If you want to go 28 mph, the new legal max, it will take most of those watts. So how long will the commercial pack last before the LVC is tripped? You need really good cells, these days. I’m looking forward to seeing how well the commercial 28 mph e bikes work, mostly because of the batteries. I was trying to go maybe 18 mph on a cruiser bike with a motor, into a 25 mph headwind and gusting higher. I managed to do 11 mph pulling 750 watts, which is where I limited the motor (20a/36v). Trying to climb a hill into a headwind? Yikes. Whatever battery pack a year old factory ebike has, and it’s probably a custom pack, it’s now obsolete. And I don’t believe they have designed the packs they use on the 28 mph bikes to be pushed hard enough. DIY, at least, lets you replace a pack for reasonable costs, upgrade or replace. Even relatively low speed e bikes encounter serious winds, winds and hills, or large folk. I want a responsive ebike, not a fast one. Most of the ebike industry seems to be behind the curve on battery tech, and matching things to the capability of the bikes. I’m willing to program a motor to a lower current, to protect marginal batteries. What young people seem to want is performance. Does the industry really understand what it takes to meet the hyped standards? These GA batteries are probably what every ‘28 mph speed pedelec’ needs. How many will have them, or something close? I don’t run them that hard to get those kinds of numbers, PAS level 3 only. If you run the pack at full throttle there is no way to get the full range out of it. Eric is downgrading the pack Ah ratings to be conservative. The GA cells put out 3500 Ah which makes that a 14Ah pack not a 13.5. I don’t know why he would do that. The GA cells are pretty awesome to be sure. 3500Ah at 10 Amps cont is what people expect but couldn’t really get in the past. Today my Shark suddenly stopped working while i was biking. There was a hard front wind and the battery was warm, but not so hot. This happened after 20km and the battery was around 30%. Front wind ate a lot of battery juice. Someone had the same problem? Use an Ah meter to see what your real energy usage is. When a display shows battery % left it is rarely accurate. but the difference for me it occured while i was using the bike, not because i made a kind of spark with the charger. Wondering Karl if you have considering the life expectancy of this and other battery pack/cells. 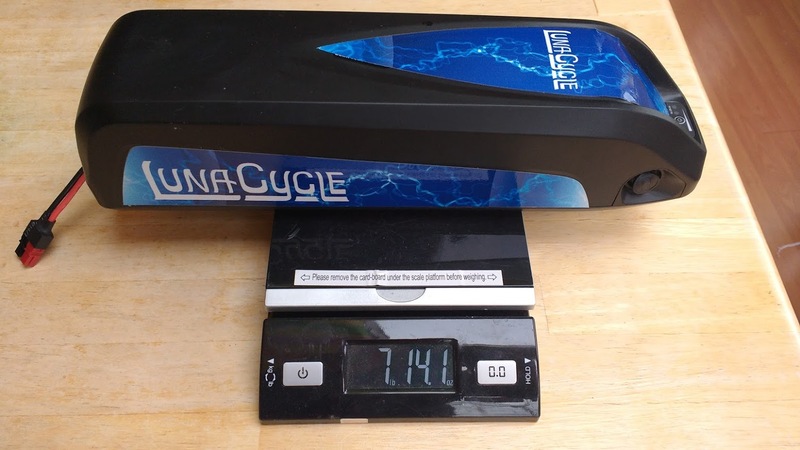 For the NCR18650GA batteries (look up Cycle Characteristics here: https://electricfatbike.files.wordpress.com/2016/03/ncr18650ga.pdf) by 300 recharge cycles, it has less than 2500mAh left of capacity, which is about 75% of it’s initial minimum capacity of 3350mAh. That’s less than a year of use if you charged them every day! And these are being sold with a advertised expected life span of 400-1000 charge cycles. Imagine the capacity at 1000 cycles! Excellent point. Those are full charge cycles charged to 100%. If you charge the battery to 80 or 90% and don’t fully discharge you will easily get 2-3 years of daily use out of the batteries. I’ve not noticed any range decrease on my GA pack and I’ve run it down to about 50% several times a week for the last 6 months. I’ve read about several users noticing a rapid decline in the the charge capacity of their batteries and being advised to charge their batteries to 100% so that balancing can occur between the cells, which evidently doesn’t happen when they are only charged to 80%. Is this something that should be done on a weekly, monthly or other frequency basis? Could you comment, Karl, on whether this has been your experience? If you charge the batteries to 80%, does that mean your Ah capacity drops 20%? If so, it might be advisable to get a battery with a capacity with a certain margin above the range desired by the buyer, no? You are correct the cells do not balance if you only charge to 80%. They will get really out of whack after a while and it will significantly drop the Ah rating of the pack. If you charge to 80% every so often you MUST charge to 100% to get the cells all to balance. I can’t say because I always charge to 100%. The packs are obsolete before they actually die on me. Karl, If I am using this battery with a ludicrous controller will it damage anything, or do I need to change anything. I just bought a Luna Banana and was wondering. Thanks in advance. Eric and I strongly disagree on this. He thinks it’s appropriate to sell a 30 amp cont battery that can burst at 40 Amps or more on a controller that is designed to do 50 Amps (and can be programmed for 60). At the very best you are using a battery that does not allow you to explore the potential of the Ludicrous controller, at the worst if you get on the Ruckus and keep the throttle pegged you certainly are never going to get much more than 40 amps out of that pack for very long and you will stress the BMS when you do it. If it were me and I wanted to really make the Ludicrous shine I would put a 7P or 8P triangle pack that can do 50 amps continuous with the Ludicrous controller. Almost immediately after writing this I found your article on “Use the right size pack” written on 1/7/17. I just sent a email to Luna to see if they would let me purchase a second pack at a discount rate like they initially offered when I bought the bike 2 weeks ago. I really want to get a triangle pack for it now. Thanks for the response. I just noticed that with both packs, when connected to the standard charger, the voltage went up to 56.5v and stopped charging (I’m stating the readout from the P850C colour display – after disconnecting from charger). The little light on the charger didn’t turn green either despite sitting at 56.5v for nearly an hour. – There’s something wrong with the battery pack since all the info I found on 52v batteries mentions 100% being around 58.8v? When you buy from China direct who knows what you’re getting. You are a braver man than I.
Karl, thanks for your response. So it turned out it was the BBSHD battery sensor. The colour display only shows voltage going up as far as 56.5v while in fact the real voltage could be higher. so the pack appears to be spot on. Weird, I always measure the battery voltage at the battery. Maybe voltage falloff for distance? That seems like a lot of voltage falloff for a few feet though. I honestly have no idea what it is. Being an amateur I haven’t got anything I can measure the voltage with apart from two BBS units with P850C displays. And the one I bought first only shows voltage up to 56.5v where the real voltage of the pack can get higher (if I switch the pack into the second unit it shows that the voltage is higher) and when you start riding the bike it stays at 56.5v the difference between 58.8 and 56.5v is used up and then starts showing proper reading as the voltage goes down. Quite weird but I don’t really mind. It is much better than worrying that there is something wrong with a brand new pack.